Setting the foundation for safe and smart choices. Tweens and teens are notorious for acting without thinking, and in fact their brains aren’t fully wired to connect choices and consequences. Join us for an interactive presentation on how adolescent brains work (and how they don’t) and how parents can use neuroscience and nature to promote social-emotional skills. Michelle Albright, a licensed clinical psychologist, will share strategies to enhance children’s self-awareness, communication and decision making skills. Cosponsored by Weston Middle School PTO. 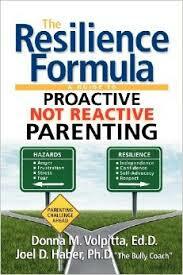 Joel Haber, PhD, co-author of The Resilience Formula will speak about how utilize proactive (rather than reactive) parenting to enhance parent-child communication and relationships. Middle school children and parents are also invited to participate in a family dinner and interactive activity. Cosponsored by Weston Public Schools; to RSVP please contact Andrea Russo at or 203-291-1405.